Ok, I am jumping the gun here but I honestly can't wait any longer. 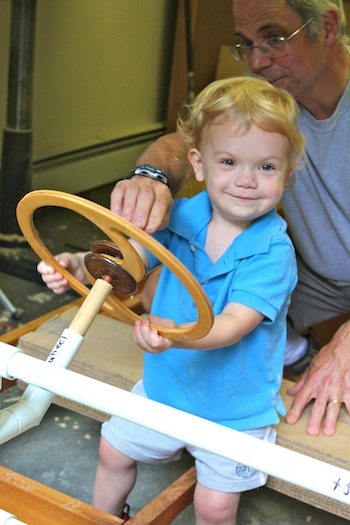 Back in July, we started a family project for our grandson. 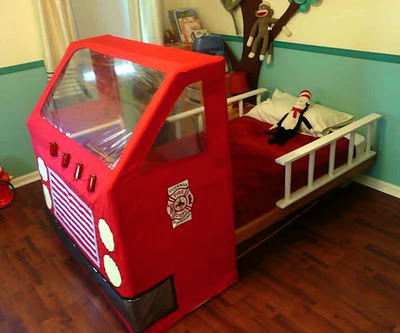 He loves fire engines and his daddy wanted to make him a fire engine bed. We started discussing and researching this months ago and decided it would be a cloth tent over a pvc pipe frame which slides over the end of the bed. It is almost done! Except for the ladders, mattress and bedspread. I just can't wait any longer to share it with you. Last weekend we delivered it to Taylor. Here are a few photos of it in his bedroom without the bed. 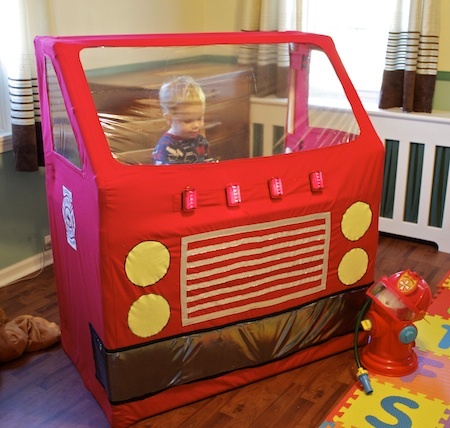 It is complete with windows and flashing lights. And on the inside there is a steering wheel! Here Taylor, dressed appropriately in fire engine jammies, demonstrates. When completed, the structure will slide over the end of Taylor's bed and he can sit on his pillows and drive the fire engine instead of taking a nap! And now for the how we did it. This won't be a step-by-step tutorial because we were finding our way as we created it. We would need to build a second one to create a tutorial and who needs two fire engine beds. I will try to give enough steps so that you could make one as well but it will require skill and creativity on your part. We had saved daughter Amy's twin bed frame. We'd made it back when she was two and set to move to a big girl bed and now it is time for Taylor (Amy and Josh's son) to inherit it. Because we have the frame (but no mattress), we sized it to fit the frame. I'd recommend you do the same. Get your measurements directly from the bed it will be used with. 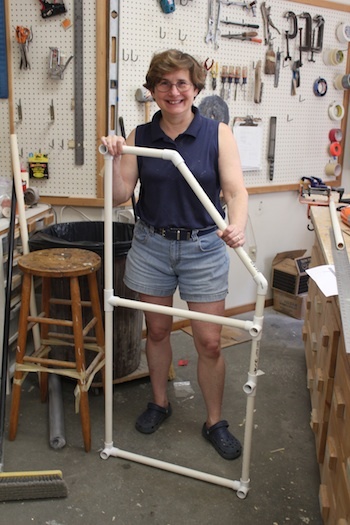 Amy designed a pvc pipe structure and figured out the connectors that would be needed. For the common ones regular piping pieces from Lowe's worked fine but for some on the more unique angles she used a green house supply company online. She ordered all the connectors and had them delivered here for our shared vacation. 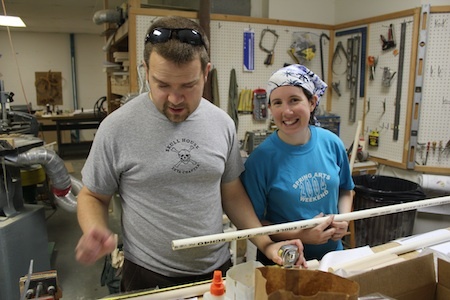 Working in David's shop, PVC pipe was cut to length according to the plan. It is relatively easy to work. A hack saw was used for initial cuts and a band saw for shorter pieces. The tent is made from two matching sides. Here is the first one assembled. It went together quickly. Amy and I constructed the PVC frame. We had the bed set up in David's studio to fit it right to the bed. 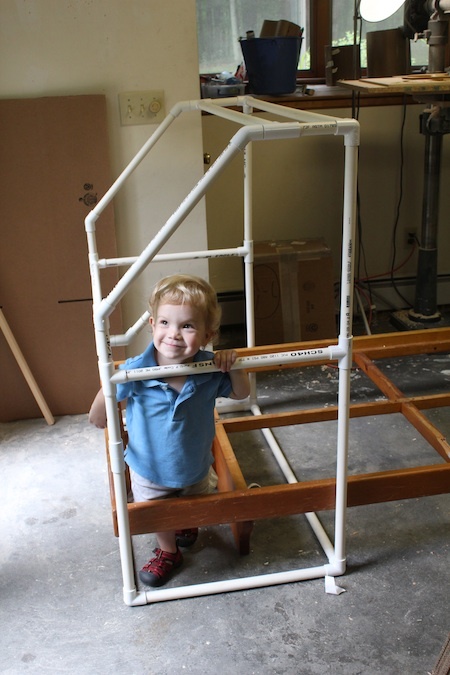 Here is a great shot of Taylor with the frame fitted over the end of the bed frame. When done it will slide right over the mattress as well. Grampa made a sterring wheel so Taylor can drive around! 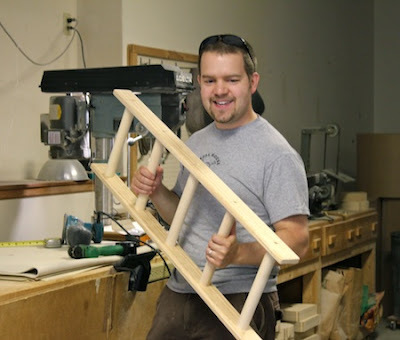 While we were making the PVC frame, Josh and David started on the ladders. 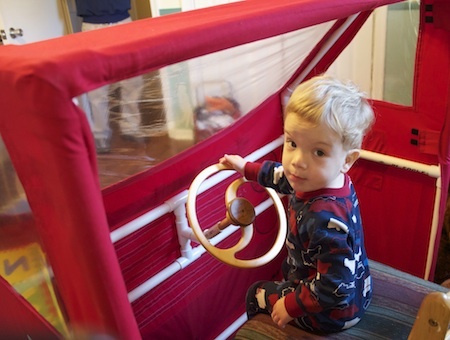 When completed the design will have two ladders attached to the side which will serve has guard rails during Taylor's transition to the big boy bed. These were made out of standard 1 x 3 pine and wooden dowels. If you have been following my blog you might remember the bridge construction project we completed last July. The fire engine project was started during the same vacation week and completion of the frame and ladders was as far as we got during the allotted time. 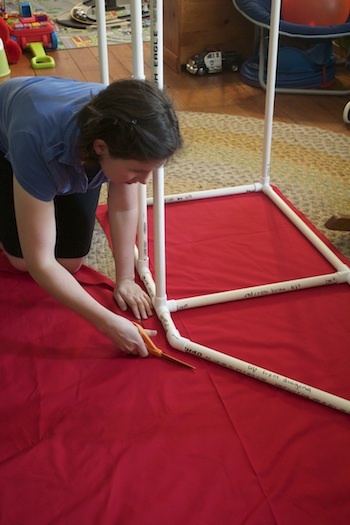 Next part was sewing the "tent" and the goal was to teach Amy some basic sewing skills as we completed this project. She has a sewing machine and no idea how to thread it. I have no idea how I raised a daughter that doesn't know how to sew! Changing times I guess. 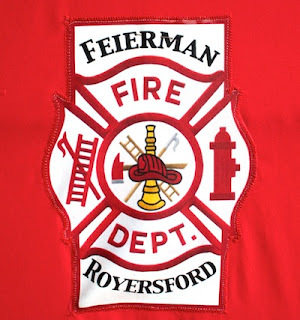 So, on our next trip to Pennsylvania in August (Amy Josh and Taylor live about a 4.5 hour drive from here) we loaded up the truck with the bed frame and all the fire engine parts. 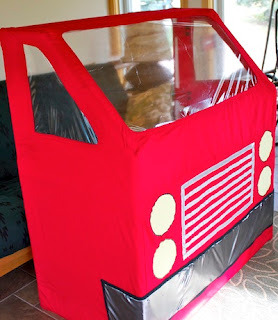 Amy had gone shopping at JoAnn's and purchased a heavy red cotton fabric for the fire engine and I had some clear vinyl for the windows. Although we were planning to eventually cement the PVC piping together we hadn't yet. It certainly made transporting it easier. In the end we found it didn't need to be glued which is great. It will come apart for easy storage when Taylor tires of fire engines. We used the actual PVC frame as our pattern to cut the fabric sides. And then using the PVC frame just like a dressmaker's frame, we pinned the parts together. I taught Amy how to thread her sewing machine even creating a video on her iphone. She can refer to the video when I am not there and she needs to thread the machine again. 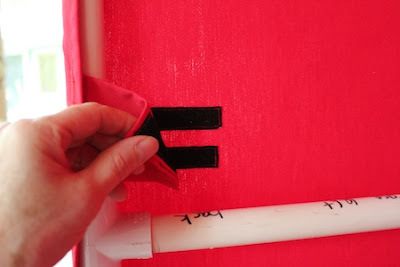 Amy completed the basic tent structure - all three sides - learning to sew and finish straight seams. The first plan was to create ties and tie the tent to the pipes. We were/are planning to paint the pvc black so we started creating black ties to hold it in place. This wasn't working well and we had run out of time again. At this point the frame was disassembled and brought back to Connecticut. I was figuring it out as we went along and I couldn't leave the tent there with instructions for Amy because I didn't know what the instructions were to be! Back at home I decided to switch to velcro fasteners. The first group I attached were at the top and it work well but I had attached them parallel to the pipe. The next batch I turned perpendicular to the pipe. This allowed for adjustments and made placement much easier. I installed all the others the same way. I put 3 sets on each of the horizontal pipes and 2 sets on each section of vertical pipe. This technique allowed me to pull the tent taut. 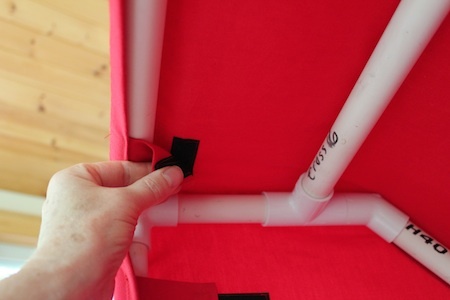 In fact it does such a good job that it holds the un-cemented pvc pipe tightly together. We have decided not to permanently attached them but to just leave them as is. Then it can be disassembled and easily stored. Once I had mastered the attachment technique it was time to give this big red structure some character. I took a trip to JoAnn's and roamed looking for the right materials. I knew I wanted to add a bumper, headlights and a grill. I found a wonderful silver fabric for the bumper and decided to use silver ribbon to create the grill. In the end I used some yellow fabric on hand for the head lights. The silver fabric for the bumper was a nightmare. It was so slippery and stretchy that it bunched as I sewed it. I ripped it out and re-did it twice and still it is a major disappointment. Finally I just had to let it go. I had pinned it and basted it in place and still it puckered. The only good part was that it only looks silvery if it puckers. Otherwise it just looks black. Strange stuff. Now it was time to figure out the windows. I had some clear vinyl and had done a test example to see if I could sew it to the fabric. I was considering gluing it in place. But sewing worked fine. If I had been working from a pattern I would have put all the windows and decorations on each flat panel. I wasn't confident enough to do that so it made manipulating the entire tent through the sewing machine challenging. 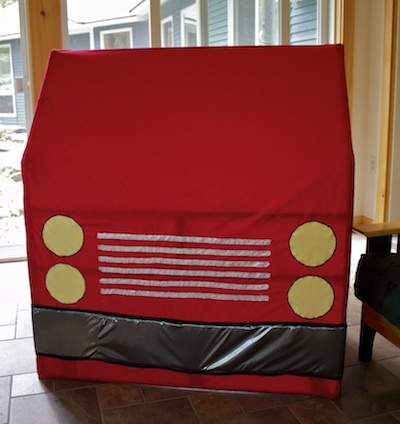 I cut each of the three window patterns out of brown kraft paper and positioned them on the fire engine. I knew once I started cutting I was committed. You can see the brown pattern still attached on the side window. 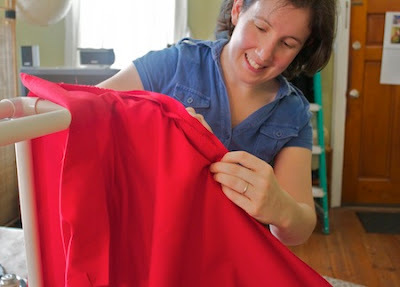 I then sewed red fabric to the front as if I was putting in a facing in a dress, cut out the center, clipped the corners, flipped it inside and pressed. I used classic dress sewing techniques and it worked well. I left enough fabric on the inside to fold over the edge of the vinyl and sewed that in place as well. I finished all three windows and finally others began to understand the concept! We decided on a few finishing touches. I did a Google image search for Fire department symbols. I found a great one and added a rectangle and personalized it for the family in Adobe Illustrator. I printed it using and ink jet printer onto dark color transfer paper (purchased at Amazon) ironed it to fabric and appliqued it onto the sides of the engine. I could have ironed it directly onto the engine but I didn't have a back out plan that way and I had never used heat transfer paper before. Results were excellent! David decided the fire engine wouldn't be complete with out flashing lights. He found small bicycle LED lights online and purchase a set of four. 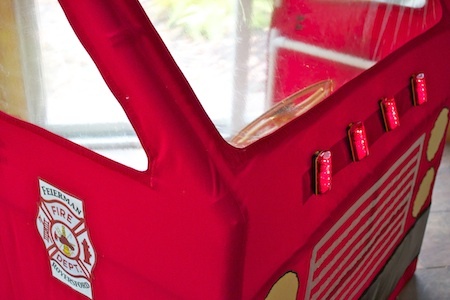 We decided to install them on the front of the fire engine so Taylor could reach them and turn them on and off. We also decided to make them capable of being clipped on or removed. That is the type of thing a little boy just might tend to abuse during nap time. Last weekend we disassembled the fire engine and brought it down to Pennsylvania. Taylor is one happy little fireman. He gave his Gramzee a big thank you hug! 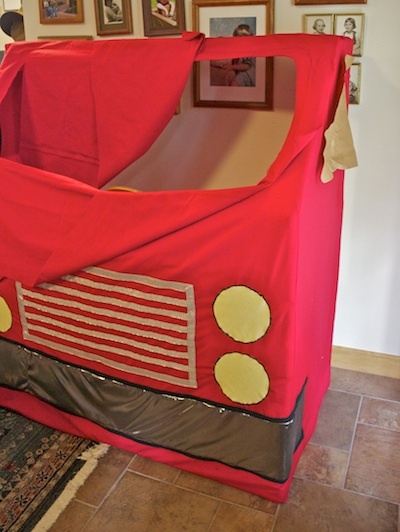 I promise to share photos of the completed fire engine once there is a bed with mattress, red bedspread and white ladders on the side. It might even have a Dalmatian puppy! Some end notes about this project. This design can be adapted to other themes - a fairy castle, a space station, etc. Just let your imagination soar. And doing family projects is a wonderful experience. Update 11/11/11: The ladders were finally attached and the engine moved into place. 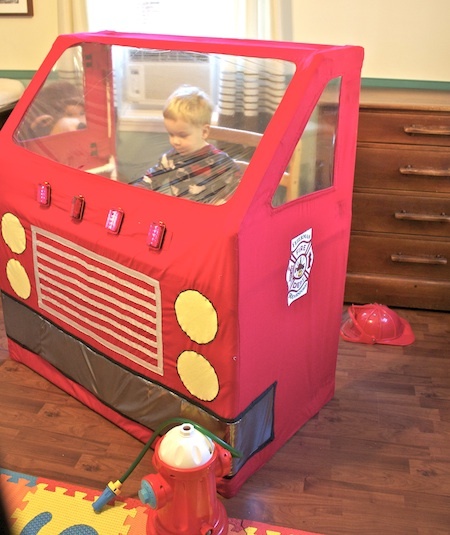 Here is a photo of the completed Fire Truck. This is BRILLIANT!!! I was totally just sitting down and trying to figure out how I could make something like this out of cloth over PVC pipe for my son and then I find your tutorial! His birthday is in June and he will LOVE something like this. Thank you so, so much!!!! 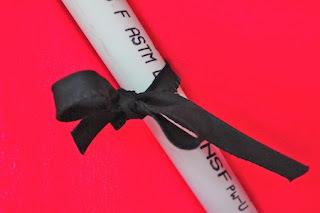 Quick question...what width PVC pipe did you use? Thank you again so much!! !